Police are clearing out one of France's biggest and oldest Roma camps, a sprawling network of makeshift shelters next to a Paris region highway, an official and an activist said. A police official with the Seine-Saint-Denis region northeast of Paris said the evacuation began today afternoon in the town of La Courneuve, after weeks of debate about the camp's future. Thousands of Roma, also known as Gypsies, are estimated to live in France, and face routine discrimination and evacuations. Their camps often lack water and electricity, and authorities often cite sanitary reasons for dismantling them. Police initially came through to tell residents to leave, and bulldozers arrived mid-afternoon, according to Manon Fillonneau of the European Roma Rights Group, speaking from the site. She described families quickly grabbing what belongings they could and gathering along a roadside under a steady rainfall. Local authorities reserved 12 rooms for residents in extreme need, such as those who are very sick, she said, calling it not nearly enough compared to the approximately 300 people being evacuated from the camp. 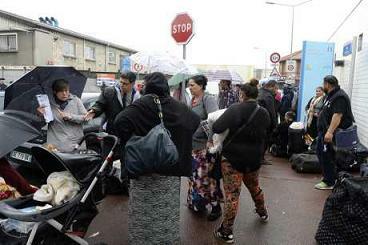 The mayor of La Courneuve wouldn't immediately comment on the evacuation.